Today's So Shoe Me is the Tease Strappy Sandal by Rebecca Minkoff, $325, available at Shopbop. 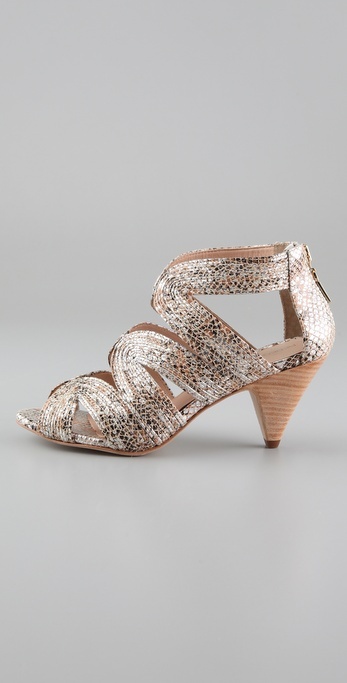 A chic cone-shaped heel and exotic snake embossed leather with a subtle metallic make these sandals the perfect pair shoes for a bit of daytime glam. A simple classic shape is updated with a curved strappy upper which adds interest without going over the top. These sandals are a chic mix of sophisticated and casual and will work with jeans and a blouse or a favorite summer dress. The mix of silver and gold tones give this slightly metallic sandal an overall neutral look which will elongate legs flatter your frame. The 2.5" heel gives the perfect lift and still remains comfortable enough to commute in. Style this sleek metallic sandal with a red cotton dress with a U-shaped neckline and pleated a-line skirt - it's the perfect flirty addition to this chic summer sandal. 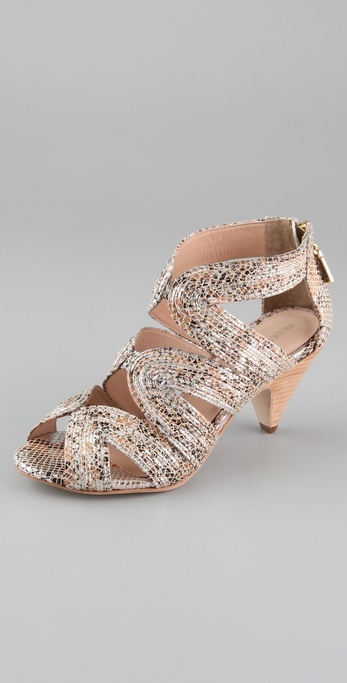 So Shoe Me a pair of sleek and strappy sandals that add daytime glamour with a luxe and subtle metallic perfect for dressed up summer get togethers. Love these. Was just looking at these the other day.. I like the neutral color and i could definitely wear these in San Fran! Nice pick!